Spring is coming and soon it'll be sakura season in Japan. I love the beautiful, delicate flowers and the season is gone in a blink of an eye. I want to go back to Japan during sakura season again. Hopefully one day I will. With sakura season coming, I decided to do another sakura-inspired EOTD. When you see sakura trees, you'll normally see pink or white blossoms blooming on the tree branches. There are no green leaves on the trees. The bark colors range from light brown to very dark brown, almost black. With this in mind, that's how I came to choose the colors that I did. After applying eyeshadow primer, I applied Swish from lash line to just above crease, from inner corner of eyelid to 3/4ths out. Smog is applied from just about the halfway point to outer corners of eyelid, putting more color in the outer 1/3 of eyelid. Using my fingertip, I applied a dab of Uzi to mid eyelid. I then lined the upper lash line and outer corner of lower lash line with K-Palette. Print is applied to the lower lash line over K-Palette eyeliner and gently fading it toward mid eye. I also applied Print to the outer "v" area of upper eyelid. I later realized that I didn't care for Uzi as much because of the glitter fall out that happened throughout the day. I did the same look again the next day and used Madreperla instead and liked it a lot better. Since I was in a sakura mood with the EOTD, I headed down to one of the Japanese goods store that sells mainly various foods. One of the vendors in this store is a bakery and a friend had told me that they were selling limited edition sakura desserts. I had to get some as I love sakura-flavored sweets. Top row: strawberry mocheese and sakura mousse. 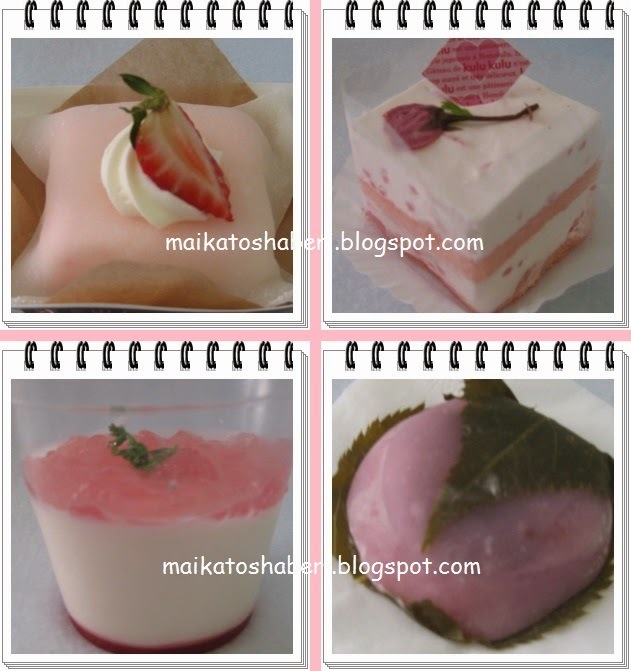 Bottom row: sakura blancmange and sakura mochi. Yes, there's a strawberry dessert in here but it looked so good that I had to get it too. The sakura mochi was from a different vendor in the store. All were delicious but the sakura blancmange is to die for! I HAVE to go back and get more before the season ends for this special dessert. My friends in Asia often tweet and instagram pictures of the various delicious desserts and drinks that they have and I'm always especially wistful of the sakura ones. I'm so happy that there's a place here that we can get them this year. Are there any special seasonal desserts that you enjoy? Please share it with me. @BeautyBox--Thank you for the kind comment! If you haven't had it before, I highly recommend the sakura baumkuchen. My friend brings it back for me every year. It's soooo yummy. I'm not sure where she gets it or what brand but I know it's somewhere in Tokyo. Might be at Tokyo Eki.